Introduction: The aim of this in vitro study was to evaluate the efficacy of 50 ug/ml silver nanoparticle (AgNPs), 70 ug/ml AgNPs and 5.25% sodium hypochlorite (NaOCl) as a final irrigant for rapid chair-side decontamination of artificially infected gutta-percha (GP) with Escherichia coli. Materials and Methods: A series 120 GP cones size 40 were taken from new batch. The GP cones were divided into six experimental group: Group I - Evaluation of the contamination of GP cones in manufacturer's Box-(20 GP cones), Group II - Evaluation of GP artificially contaminated with E. coli(100 GP cones), Group III - Evaluation of the effectiveness of 50 ug/ml of AgNPs for decontamination of the cones contaminated with E. coli(n = 20 GP infected cones from Group II), Group IV - Evaluation of the effectiveness of 70 ug/ml of AgNPs for decontamination of the cones contaminated with E. coli(n = 20 GP infected cones from Group II), Group V - Evaluation of the effectiveness of 5.25% NaOCl for decontamination of the cones contaminated with E. coli(n = 20 GP cones infected from Group II). Aliquots from the experimental GP cones were plated on brain heart infusion agar (HiMedia Lab, Mumbai, India), and the colony-forming units were evaluated under colonimeter. Results: 70 ug/ml of AgNPs, 5.25% NaOCl exhibited similar antimicrobial effect (P = 1). Highly significant difference were found when 50 ug/ml compared with 70 ug/ml and 5.25% NaOCl (P < 0.0001). Conclusion: 70 ug/ml of AgNPs (0.007%) proved to be highly effective against E. coli and showed similar antimicrobial efficacy as 5.25% NaOCl at 750 times lesser concentration. GP cones are the most commonly used material for filling the root canal. They are biocompatible, dimensionally stable, radiopaque, thermoplastic and easily removed from the root canal. Even though GP cones are produced under aseptic conditions and have potentially antimicrobial properties, especially owing to their zinc oxide component, they can be contaminated by handling and also by aerosols and physical sources during the storage process.,,, Therefore, the handling of GP cones must follow the basic principles of infection control. In addition, GP cones that have been in contact with patients should be discarded1. Owing to the thermoplastic characteristic of GP cones, they may not be sterilized by the conventional process in which moist or dry heat is used, because this may cause alteration to the GP structure.,,,,, For this reason, previous studies suggested that several different chemical agents could be used for the rapid decontamination of GP cones in dentistry. Montgomery showed that commercially available GP cones may be contaminated, even if carefully removed from factory-sealed containers. Contamination of GP cones may also occur during treatment, prior to their use. A GP master cone which does not fit well in one prepared root canal could still be used in another if effectively sterilized. Since the use of standard high temperature sterilization would deform GP cones, a rapid, chairside decontamination method is needed. Several studies have examined cold sterilizing agents for GP.,,, One of the earlier reports regarding sterilization of GP cones, by Buchbinder, recommended exposing the cones to paraformaldehyde vapour for 3 h. Senia et al. found that formocresol vapour sterilized GP cones within 16 h. Such methods may be satisfactory for long-term storage of GP cones, but it is not suitable for rapid decontamination of GP during treatment. Several chemical solutions for cold disinfection have been evaluated, such as polyvinylpyrrolidone-iodine, ethyl alcohol, sodium hypochlorite (NaOCl), hydrogen peroxide, quaternary of ammonium, glutaraldehyde, chlorhexidine liquid, Deconex 53plus. The time for these substances to kill microorganisms ranges from a few seconds to substantial periods of time.,,,, NaOCl is one of the most widely used endodontic solutions, either as an irrigant or for rubber dam and cone decontamination. Its concentration ranges from 0.5% (Dakin solution) to 5.25%. Though antimicrobial activity of AgNPs has already been investigated but rapid decontamination of GP by AgNPs has never been studied. The main objective of this paper is to evaluate and compare two different concentration of AgNPs and NaOCl when used as a chair side decontaminant after artificially infecting GP cones with E. coli. Group V-Evaluation of the effectiveness of 5.25% NaOCl for decontamination of the cones contaminated with E. coli (n = 20 GP cones infected from Group II). The microorganism used in the study was procured from ATCC (American type culture collection), representing the one of the bacteria that may act as contaminants in dental surgery E. coil. (ATCC 10536, Gram-negative). The culture was maintained on desired media agar slants at optimum temperature forin vitro growth, dated and labeled properly, stored at 4°C and sub-cultured periodically. Successive sub-culturing of the microbial strains was done with particular attention. Their purity was examined at regular intervals by staining and biochemical test. The growth media used in the current study were Brain Heart Infusion (BHI) media, for bacteria. The GP cones were artificially contaminated with E. coli. A 24-h old pure culture of E. coli was grown in BHI agar plates. The plates were then incubated at 37°C for bacteria for 24–48 h, aerobically in a bacteriological incubator. Microbial suspensions of these cultures were prepared in sterile saline solution (0.85% w/v of NaCl), with the density of 0.5 McFarland corresponding to 1.5 CFU/ml × 108 CFU/ml (CFU = colony forming units) for bacteria adjusted spectrophotometrically. BHI broth (for bacteria) was prepared by dissolving appropriate amount of media in distilled water and sterilized by autoclaving at 121°C (15 lb/in2) for 15 min. Under aseptic conditions, the GP cones were contaminated by immersion in broth previously inoculated with 0.1 ml of standardized microbial suspensions of the microorganism. In order to promote surface contamination, the cones were incubated at 37°C for bacteria for 24–48 h, aerobically in bacteriological incubator. Thereafter, the cones were transferred to sterile paper filter pads in petridish, briefly dried at room temperature under sterile condition and then disinfected. The artificially contaminated GP cones were subsequently subjected to decontamination using 50 ug/ml AgNPs, 70 ug/ml of AgNPs and 5.25% NaOCl and their disinfectant property were evaluated and compared. Two different concentrations of Ag-NP were used i. e. 50 μg/ml and 70 μg/ml while NaOCl were used with 5.25%. The testing times to disinfectant the cones was: 1 min. The contaminated cones were immersed individually in micro-centrifuge tubes containing 1.5 ml of the respective disinfectant to be tested and were vortexed for 1 min. After that, the cones were transferred to tubes containing saline solution (0.85% NaCl) and shaken for 30 s to detach any remaining microbial cells. These saline suspensions were then used as an inoculum for further procedure. The pour-plate method (for bacteria) was employed to observe the presence of microbial colonies. For this, the BHI agar medium was prepared and sterilized by autoclaving at 121°C (15 lb/in2) for 15 min. The petriplates were washed thoroughly, sterilized in autoclave and dried in hot air oven at 160°C for 2 h for complete removal of moisture. Under aseptic condition, 0.1 ml of each saline suspension (bacterial inoculum) was added to the respective sterile, labeled and empty petridishes and approximately 15–18 ml of sterilized molten BHI agar was added to it. Prior to pouring, the agar media was cooled between 45°C and 50°C to avoid killing of bacterial cells and to minimize the amount of condensation that forms. The plates were then gently tilt and swirl to ensure proper mixing of inoculum with the media and were allowed to completely solidify at room temperature. These solidified plates were then incubated at 37°C for 24 h and observed for (CFU/ml). The possibility of initial contamination of GP cones as well as the effectiveness of the contamination procedure employed was examined by cultivating decontaminated GP cones (negative-control) and contaminated GP cones (positive-control) individually into sterile BHI broth. All control groups were inoculated in selected agar media and incubated at appropriate temperature and for 24–48 h.
Statistically analyses used for result were unpaired t-test and one-way analyses of variance (ANOVA) was used for the investigation of difference in CFU of E. coli. Comparison between Group III, Group IV and Group V – Evaluation of the effectiveness of 50 ug/ml of AgNPs, 70 ug/ml of AgNPs and 5.25% NaOCl for decontamination of the cones contaminated in E. coli: ANOVA test was applied for intergroup analyses. Statistically highly significant difference was observed (P ≤ 0.0001) [Figure 1] and [Table 4]. The results of this study showed that none of the brand new GP cones that were cultured showed bacterial contamination as evaluated by culture. This corroborates others that also found no contamination in sealed new GP cones., However, our study is in contradiction to several studies, which did find contamination on GP cones from new packaging. AgNPs was another disinfectant used in the present study have shown excellent antimicrobial property. The antibacterial activity of 70 ug/ml AgNPs against E. coli was found to be higher than that of 50 ug/ml [Table 1]. The present study was in accordance with the study conducted by Kim et al. who reported that the minimum inhibitory concentration of AgNPs for E. coli, Gram-negative bacteria(0.33 nM) was lower than that for S. aureus, Gram-positive bacteria (3.3 nM), which was a 10-fold difference. This may be attributed to the fact that Gram-negative bacteria have relatively thin cell walls and thus are more prone to physical destruction. In the present study the size of the AgNPs was 21.3–2 9.1 nm. Shape of AgNPs used in the present study was truncated triangular which was found to provide better bactericidal action which corroborates with earlier studies., Truncated triangular silver nanoplates with a (111) lattice plane as the basal plane displayed the strongest biocidal action, compared with spherical and rod-shaped nanoparticles and with Ag (in the form of AgNO3). It is proposed that nanoscale size and the presence of a (111) plane combine to promote this biocidal property. Study conducted by Hwan et al. showed that Minimum Inhibitory concentration for inhibiting S. aureus is 100 ug/ml and 150 ug/ml for E. coli. On contrary in the present study 70 ug/ml completely eliminated E. coli which has bettered the previous studies. Study conducted by Raffi et al. found that complete elimination of E. coli at 60 ug/ml which was analogous to present study result. Some researchers have reported that the antimicrobial effect of the AgNPs on Gram-negative bacteria was dependent on the concentration of Ag in the nanoparticles and was closely related to the formation of “pits” in the cell walls. Further, negatively charged AgNPs accumulated in the bacterial membrane increased the permeability of the membrane. Miura and Shinohara determined the biologic effects of AgNPs exposure to mammalian cells. In their paper, Hela cells were evaluated by being exposed to different concentrations of AgNPs. They concluded that 120 μg/ml concentration could be harmful for Hela cells. By considering this study, a therapeutic window can be provided to use AgNPs in 0.005% and 0.007% concentration as a novel intracanal irrigant. On the other hand, because of broad spectrum antibacterial action of AgNPs and its influence on Gram-positive and negative bacteria, more investigations are needed to consider AgNPs as an irrigant in primary polymicrobial endodontic infections. In the present study it has been clearly observed that there was huge reduction of microcolonies of E. coli by both AgNPs and NaOCl. Lesser concentration of AgNPs has been able to reduce the colony growth but was unable to completely eliminate the growth. However, 70 ug/ml (0.007%) of AgNPs completely annihilates the bacterial growth so does 5.25% NaOCl. So it can be inferred that AgNPs has same antimicrobial efficacy at 750 times lesser concentration. Dumani A, Yoldas O, Isci AS, Köksal F, Kayar B, Polat E, et al. Disinfection of artificially contaminated resilon cones with chlorhexidine and sodium hypochlorite at different time exposures. Oral Surg Oral Med Oral Pathol Oral Radiol Endod 2007;103:e82-5. Ozalp N, Okte Z, Ozcelik B. The rapid sterilization of gutta-percha cones with sodium hypochlorite and glutaraldehyde. J Endod 2006;32:1202-4. Redmerski R, Bulla JR, Moreno T, Garcia LB, Cardoso CL. Disinfection of gutta-percha cones with chlorhexidine. Braz J Microbiol 2007;38:649-55.
de Souza RE, de Souza EA, Sousa-Neto MD, Pietro RC.In vitro evaluation of different chemical agents for the decontamination of gutta-percha cones. Pesqui Odontol Bras 2003;17:75-7. Tanomaru JM, Pappen FG, Tanomaru Filho M, Spolidorio DM, Ito IY.In vitro antimicrobial activity of different gutta-percha points and calcium hydroxide pastes. Braz Oral Res 2007;21:35-9. Valois CR, Silva LP, Azevedo RB. Structural effects of sodium hypochlorite solutions on gutta-percha cones: Atomic force microscopy study. J Endod 2005;31:749-51. Maniglia-Ferreira C, Silva JB Jr., Paula RC, Feitosa JP, Cortez DG, Zaia AA, et al. Brazilian gutta-percha points. Part I: Chemical composition and X-ray diffraction analysis. Braz Oral Res 2005;19:193-7. Isci S, Yoldas O, Dumani A. Effects of sodium hypochlorite and chlorhexidine solutions on resilon (synthetic polymer based root canal filling material) cones: An atomic force microscopy study. J Endod 2006;32:967-9. Cardoso CL, Redmerski R, Bittencourt NL, Kotaka CR. Effectiveness of different chemical agents in rapid decontamination of gutta-percha cones. Braz J Microbiol 2000;31:67-71. Montgomery S. Chemical decontamination of gutta-percha cones with polyvinylpyrrolidone-iodine. Oral Surg Oral Med Oral Pathol 1971;31:258-66. Senia ES, Marraro RV, Mitchell JL, Lewis AG, Thomas L. Rapid sterilization of gutta-percha cones with 5.25% sodium hypochlorite. J Endod 1975;1:136-40. Suchde RV, Talim ST, Billimoria KF. Efficiency of cold sterilizing agent for endodontic procedure. J Dent Res 1979;58:670. Frank RJ, Pelleu GB Jr. Glutaraldehyde decontamination of gutta-percha cones. J Endod 1983;9:368-71. Buchbinder M. Sterilization of cotton points and gutta percha points: Description of technique. N Y J Dent 1966;36:200-1. Senia ES, Marraro RV, Mitchell JL. Cold sterilization of gutta-percha cones with formocresol vapors. J Am Dent Assoc 1977;94:887-90. Stabholz A, Stabholz A, Friedman S, Heling I, Sela MN. Efficiency of different chemical agents in decontamination of gutta-percha cones. Int Endod J 1987;20:211-6. Siqueira JF Jr., da Silva CH, Cerqueira M das D, Lopes HP, de Uzeda M. Effectiveness of four chemical solutions in eliminating Bacillus subtilis spores on gutta-percha cones. Endod Dent Traumatol 1998;14:124-6. Neal AL. What can be inferred from bacterium-nanoparticle interactions about the potential consequences of environmental exposure to nanoparticles? Ecotoxicology 2008;17:362-71. Kishen A, Shi Z, Shrestha A, Neoh KG. An investigation on the antibacterial and antibiofilm efficacy of cationic nanoparticulates for root canal disinfection. J Endod 2008;34:1515-20. Waltimo T, Brunner TJ, Vollenweider M, Stark WJ, Zehnder M. Antimicrobial effect of nanometric bioactive glass 45S5. J Dent Res 2007;86:754-7. Sanvicens N, Marco MP. Multifunctional nanoparticles – Properties and prospects for their use in human medicine. Trends Biotechnol 2008;26:425-33. Busscher HJ, Engels E, Dijkstra RJ, van der Mei HC. Influence of a chitosan on oral bacterial adhesion and growth in vitro. Eur J Oral Sci 2008;116:493-5. Chen J, Han CM, Lin XW, Tang ZJ, Su SJ. Effect of silver nanoparticle dressing on second degree burn wound. Zhonghua Wai Ke Za Zhi 2006;44:50-2. Cohen MS, Stern JM, Vanni AJ, Kelley RS, Baumgart E, Field D, et al. In vitro analysis of a nanocrystalline silver-coated surgical mesh. Surg Infect (Larchmt) 2007;8:397-403. Lansdown AB. Silver in health care: Antimicrobial effects and safety in use. Curr Probl Dermatol 2006;33:17-34. Alt V, Bechert T, Steinrücke P, Wagener M, Seidel P, Dingeldein E, et al. Anin vitro assessment of the antibacterial properties and cytotoxicity of nanoparticulate silver bone cement. Biomaterials 2004;25:4383-91. Feng QL, Wu J, Chen GQ, Cui FZ, Kim TN, Kim JO, et al. Amechanistic study of the antibacterial effect of silver ions on Escherichia coli and Staphylococcus aureus. J Biomed Mater Res 2000;52:662-8. Morones JR, Elechiguerra JL, Camacho A, Holt K, Kouri JB, Ramírez JT, et al. The bactericidal effect of silver nanoparticles. Nanotechnology 2005;16:2346-53. Doolittle TP, Rubel RL, Fried I. The effectiveness of common office disinfection procedures for gutta-percha and silver points. N Y State Dent J 1975;41:409-14. Seabra Pereira OL, Siqueira JF Jr. Contamination of gutta-percha and resilon cones taken directly from the manufacturer. Clin Oral Investig 2010;14:327-30. 33. Kim JS, Kuk E, Yu KM, Kim JH, Park SJ, Lee HJ, et al. Antimicrobial effects of silver nanoparticles. Nanomed Nanotechnol Biol Med 2007;3:95-101. Pal S, Tak YK, Song JM. Does the antibacterial activity of silver nanoparticles depend on the shape of the nanoparticle? A study of the gram-negative bacterium Escherichia coli. Appl Environ Microbiol 2007;73:1712-20. Hwan KS, Lee HS, Ryu DS, Choi1 SJ, Lee1 DS. Antibacterial activity of silver-nanoparticles against Staphylococcus aureus and Escherichia coli. Korean J Microbiol Biotechnol 2011;39:77-85. Raffi M, Hussain F, Bhatti TM, Akhter JI, Hameed A, Hasan MM. 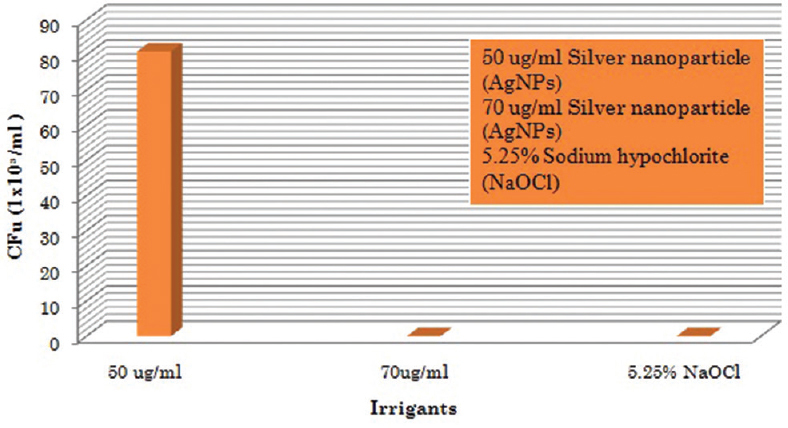 Antibacterial characterization of silver nanoparticles against E. coli. J Mater Sci Technol 2008;24:192-7. Sondi I, Salopek-Sondi B. Silver nanoparticles as antimicrobial agent: A case study on E. coli as a model for gram-negative bacteria. J Colloid Interface Sci 2004;275:177-82. Miura N, Shinohara Y. Cytotoxic effect and apoptosis induction by silver nanoparticles in HeLa cells. Biochem Biophys Res Commun 2009;390:733-7.